THIS IS surely the definitive work on Gwen John and is essential for anyone interested in women artists or art of the 20th century. Gwen John (1876-1939), ten years ago virtually unknown, today is considered worthy of a place in art history. The book with its magnificent representations of all her 200 paintings and an extensive selection of her several thousand drawings is a sheer delight. There is a fully documented biography which draws on some previously unpublished material, extensive quotations. Cecily Langdale assesses the artist’s achievements and places her life in a historical context through a complete catalogue of her oil paintings and many of her drawings and water-colours. Gwen John, born in Tenby, Wales, was among the first women students at the Slade. Her three years of academic training stayed with her always. Augustus John, her flamboyant elder brother, also considered to be talented artistically, was emulated by fellow students though Gwen John always maintained her distance from him. He was frequently concerned and criticised her disregard for her health and well-being, traits which ultimately caused her decline and death. In 1904 Gwen John settled in Paris where she worked as an artists’ model and had some exhibitions and sales. Among the artists she posed for was the famous Auguste Rodin. Cecily Langdale has had access to the thousands of letters Gwen John wrote to him over the ten years of their friendship. 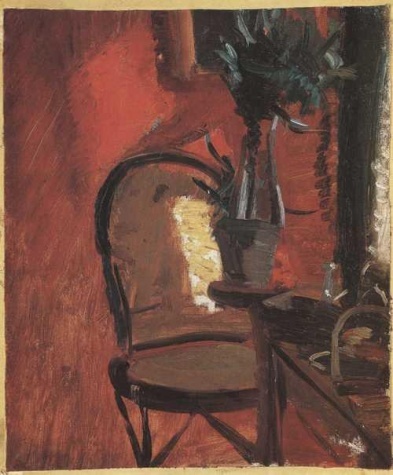 The author, unlike other biographers, does not dwell on this relationship though she does feel that Gwen John did accept his guidance, in that her linear compositions became looser and more spontaneous during this period. Throughout her life Gwen John formed several very strong attachments to people, often with quite disastrous endings. Gwen John painted and drew still lives, interiors, cats, children in church but the bulk are portraits in thick oil impasto of single seated women before a simple background. Her main interest was the formal aspect of painting; models were conceived as ‘an affair of volumes, not as individuals’. The pose is simple and static, the body seen as a study in which detail is suppressed. The artist’s palette and tonal values are restricted as a generalised light covers the form. Gwen John repeated compositions, sometimes up to ten times with very little change. As she rarely dated her work the author admits that it is impossible to draw any conclusions of the time progress or changes of her working methods. Previously considered unfinished studies were regarded as finished by the artist as were her large and small canvases. The author explains Gwen John’s working techniques and subject matter through close examination of the work; and combined with the quotations the reader gets a very clear impression of this secretive artist. In 1912-13 she became a Roman Catholic and thereafter there are portraits of nuns. Gwen John also drew numerous back views of women and children sitting in church; these had colour washes added later. Her faith remained vital to her for the rest of her life. Gwen John was greatly encouraged to paint by the dealer John Quinn. They were introduced in 1910 and remained in close contact until his death in 1924. He acquired over a dozen art for sale online. In return she was assured financial security. Their correspondence is a valuable insight into her views of contemporary art, as through his encouragement she visited exhibitions and was introduced to other artists. In 1935 she broke bones in her hands and wrists which naturally prevented her from drawing or writing, though she apparently ceased painting in about 1928. There is no evidence that she painted during the last years of her life though she did not stop thinking and writing about art. It is believed that she finally gave up on life and stopped eating and looking after herself. She died in Dieppe in 1939. Augustus remarked: ‘she had neglected to bring any baggage with her, but had not forgotten to make provision for her cats’. The visual and written information make this the most sensitive biography of this artist. Among much current opinion, Cecily Langdale has shown that Gwen John did exhibit and sell.